On their first trip on the road, Borough took no time in opening the scoring, writes Paul Collins. Remae James latched onto a second-minute through ball, showing great strength, shrugging off two defenders and heading the ball down into his path to strike home. Despite an uneven pitch Rugby started to play their normal passing game, but within 15 minutes Ollie Chater headed the ball over from Connor Gamble’s boot. 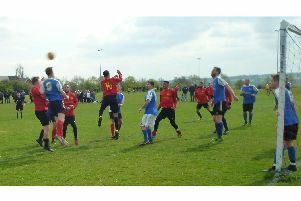 The lads were defending well with Caterpillar rarely troubling keeper Dan Flack. A brilliant strike from Adam Shaw just inside the penalty area, with a superb twisting volley, made it 2-0 after 25 minutes. Luke Pritchard and Ryan Byrne both worked hard in midfield to break up the Caterpillar attacks, with Shaw going close again shortly after, just shooting wide through good play from James. A few minutes into the second half Alex Winton replaced an injured Tim Orford, slotting in nicely at right back, but the play was a very scrappy affair with both sides struggling to keep possession. Borough were reduced to ten men on 66 minutes with Ollie Chater being shown a red card. Connor Gamble went on a great run down the right, from inside his own half, but his cross was deflected just wide. Borough were now defending well with one player down, with Kane Finney and Jamie Tank winning every ball in the air. Caterpillar struggled to make any further clean cut chances and Flack remained alert but unbothered in another solid performance for the Borough. Borough line up: D Flack, C Gamble, T Orford, L Pritchard, J Tank (C), K Finney, R Byrne, A Shaw, R James, W Heath, O Chater. Subs: A Winton, D Finlay, G Highton. Thank you to Samuel Collins for running the line. # Rugby Borough manager Darren Tank was delighted with his side as they stretched their unbeaten run on Tuesday night with an away win at Birstall. Borough sit at the top of the table and Tank is loving it: “The young players that we have in the team are a breath of fresh air, and they keep working for 90 minutes to get results,” he said. Tank is now looking forward to a run of home games, starting this Saturday against County Hall, kicking off at 3pm, followed by a Beacon Hill Cup tie against St Andrews on Monday night with a 7.30pm kick-off. Tank goes on to say: “Winning home games is the key to success in any league, picking up a few away points just helps the cause.